The Kokomo Downtown Farmers Market recognizes the importance of access to nutritious food. With the help of a grant from the United States Department of Agriculture, the KDFM has included community wellness outreach alongside its efforts to connect the growers and producers of local, fresh food with the community. As part of this initiative, a Community Wellness tent at every market will provide a wide variety of educational information about food, including, but not limited to, recipes, nutrition facts, cooking methods, storage, and budgeting. The Kokomo Downtown Farmers Market will also provide regular cooking and food demonstrations. 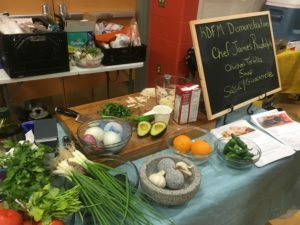 Chefs from the community will demonstrate a variety of cooking techniques, diet concerns, nose to tail cooking, and much more. 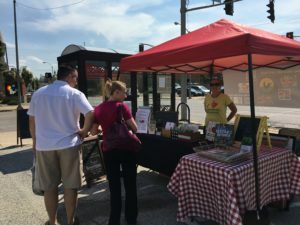 The Kokomo Downtown Farmers Market provides free community wellness and food education year-round for organizations, businesses, churches, and other groups. Topics include cooking education, basic nutrition, meal planning & budgeting, reducing food waste, food access and barriers, and promoting change. Topics can be designed for your specific group. You can request more information by sending an email to kdfm_snapoutreach@comcast.net. The Kokomo Downtown Farmers Market believes equal access to nutrition is vital to a healthy community. The KDFM happily accepts Supplemental Nutrition Assistance Program (SNAP) benefits, formerly known as food stamps, and Women, Infant, & Children (WIC) vouchers. You can find out more information about SNAP and WIC at the KDFM SNAP tent. The KDFM also offers the “Double Bucks” program to further assist SNAP recipients by doubling their SNAP dollars, up to $10, to purchase items like fruits and vegetables.